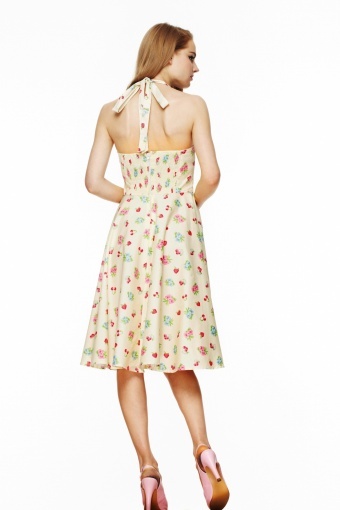 Gorgous 1950s style halter Bobbilee Dress Pastel Yellow Summerfruit from Bunny. Love at first sight! This is an übercute vintage style halterneck dress, in a trendy soft yellow colour and summer fruit and floral print ending in a flowing full circle skirt made of coton with stretch. The back has an elasticated panel which ensures a tight fit around the bust and waist, the top is lined with the same fabric. 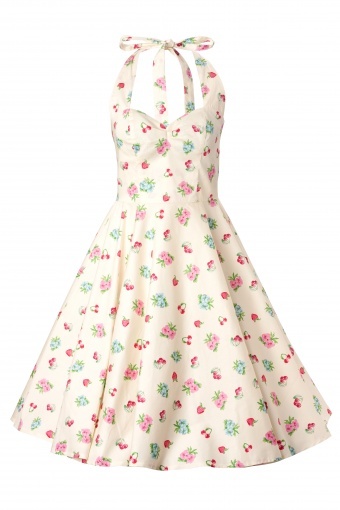 This 50s vintage style dress can also be worn with a petticoat underneath to add volume as shown on one of the pictures. 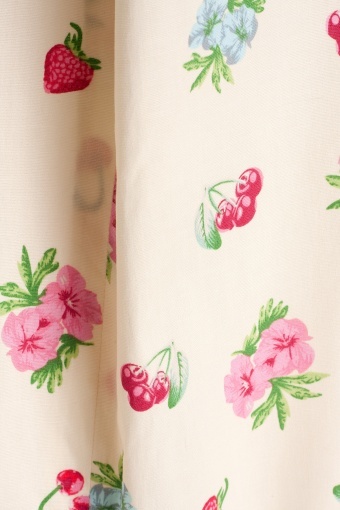 Whether your tastes run to traditional fifties florals or wild novelty prints, we've something to suit everyone and every occasion, from parties to summer picnics. Also availble in Mint Green!